My friend Paula, a Nebraska native, has been after me to read this book for years and now I understand. I’d been spending nearly all of my reading time with early 20th century mysteries and, quite frankly, they’d become tedious. After forcing myself through The Red House by A.A. Milne, I really felt like I needed a change of pace. I had downloaded a whole bunch of free books to my Kindle for this reading project, and My Antonia just happened to be at the top of the list, so I casually opened it one night a week ago to see what it was all about. I found a beautiful, heartbreaking, luminous story that captivated me from the first page. 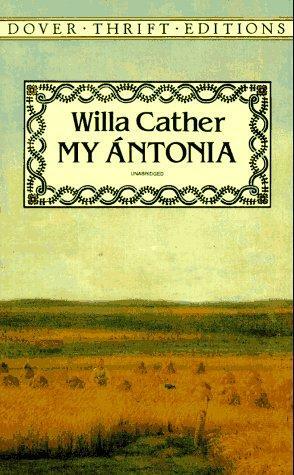 Cather tells the story of Antonia Shimerda, a headstrong, handsome Bohemian girl whose family is transplanted to Black Hawk, Nebraska in the 19th century. Antonia’s story is told through the eyes of Jim Burden, an orphan who also arrives to live with his grandparents in Black Hawk on the same train as Antonia and her family. The two become fast friends whose lives twine around each other over the course of a lifetime. The interesting thing about this story that is so different from what I’ve been reading is that there really isn’t a storyline. This is a memoir, a re-telling of a bucolic if hard childhood on the prairie, coming of age in a small mid-western town, and adulthood not yet devoid of childhood innocence and affection between lifelong friends. I was reminded of two stories as I read this one – Little House on the Prairie by Laura Ingalls Wilder and the 2010 Newbery winner Moon Over Manifest by Clare Vanderpool. The sod houses of Wilder’s early books are here, as is the red prairie grass, snakes, farms, and family devotion. The similarity to Manifest, Kansas is more in the characters drawn by Cather and Vanderpool than in the story. However, all three books share the same comforting, lovely tributes to the importance of family and friends. Cather’s characters, from Antonia and her regal but defeated father, to the foreign farm girls who go to town as “hired girls,” to Antonia’s husband and colorful tribe of children, to the narrator – Jim Burden himself – are finely drawn and developed with care and compassion. She captures the tender friendship between Antonia and Jim, which becomes the thread that twines through the entire story and ultimately makes it successful. A beautiful book that will stay with me for a long, long time.